We interrupt our regularly scheduled Green Goblin Top 10 storyline countdown to celebrate one of my favorite miniseries of all time. I realize I am on the cusp of revealing my No. 1 choice in m countdown (what could POSSIBLY be the greatest Green Goblin story ever? ), but I’m hopeful the following post will inspire enough pleasant memories for some of you that you will overlook the bait and switch. As my Gimmick or Good? column demonstrates, there were plenty of quality comics from the 90s that sported these marketing “gimmicks,” but one miniseries in particular has always been a cut above the rest. 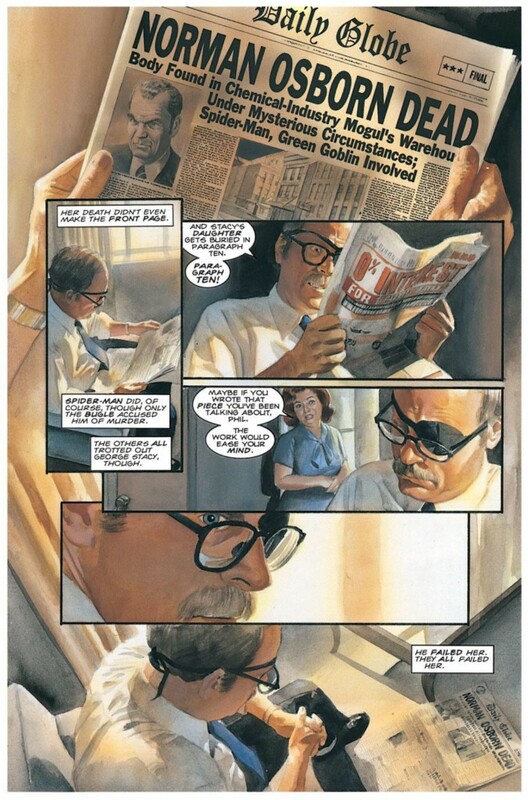 In 1994, Kurt Busiek and newcomer Alex Ross created the four-part Marvels mini, a re-imagining of some of Marvel Comics most popular heroes and villains as told through the lens of the fictitious news photographer Phil Sheldon. Twenty years after the fact, Marvels is best remembered as being the official coming out party for artist Alex Ross, whose painted style was arguably one of the most important creative developments to come out of comics in the modern era. Ross’s interpretation of all of these classic heroes was so dramatically different and beautiful, he became an instant superstar still garnering critical acclaim for his artwork two decades later. I actually discussed Marvels as a whole in a Gimmick or Good? column last year. I remember walking into my local comic book shop as a teenager and seeing this series with painted artwork and a curious-looking outer plastic protective case around it (dubbed an “acetate cover”). But the individual comics cost $5 a pop, which was way too expensive for a teenager who was just starting to invest all of his allowance and birthday money into buying some of his first Silver Age copies of Amazing Spider-Man. I took a pass on the series, but went on to discover it more than a decade later when I picked up a hardcover collection. Needless to say, my mind was blown. 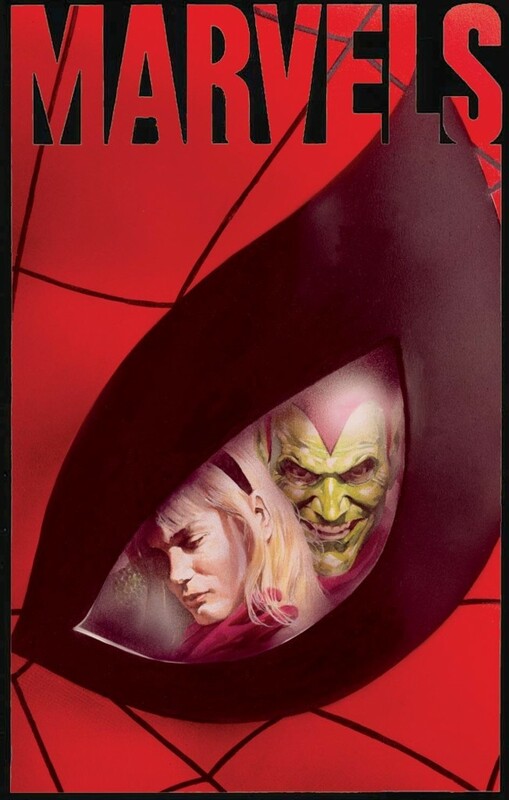 For the purposes of keeping this post Spider-Man-centric (this is a Spider-Man blog after all), I thought I’d share a few thoughts about Marvels #4, which examines the death of Gwen Stacy. Something that comic book fans have a tendency to quibble about ad nauseam is whether or not a specific creator “gets” the character he’s working on. 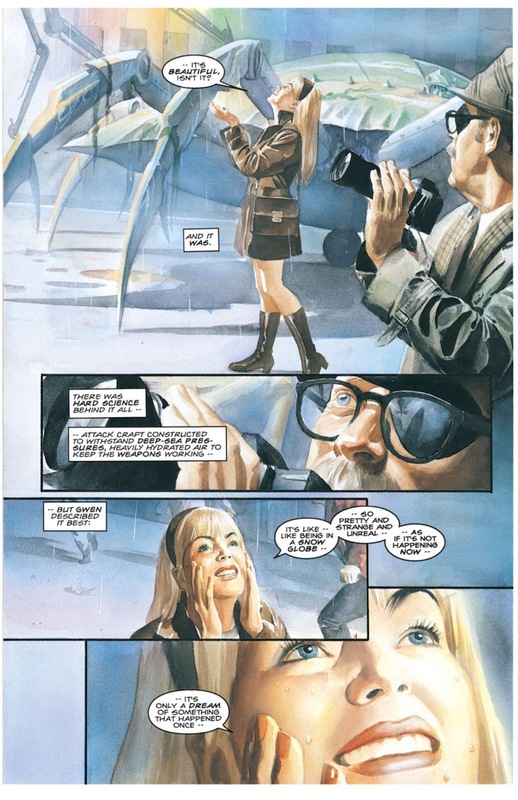 In Marvels #4, Busiek demonstrates such an insightful and respectful understanding as to why “The Night Gwen Stacy Died,” is considered not only one of the most important Spider-Man stories of all time, but a seminal work in the medium’s history, a part of me wonders if he traveled back in time and switched brains Superior Spider-Man-style with the comic’s original writer, Gerry Conway. Busiek crafts a masterpiece because he effectively captures so many different emotional beats from the original story, while also filling in the gaps and providing additional context. 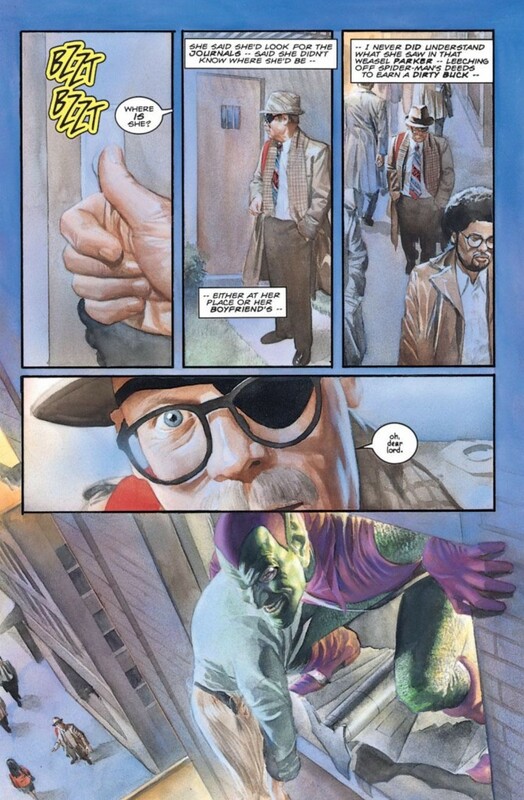 Within this story, Sheldon, is fresh off the success of his Marvels photograph book, so he sets out to clear Spider-Man’s name in the death of police Captain George Stacy. After striking out during interview with various witnesses and Doctor Octopus himself (who, in a great moment tells Sheldon he can neither confirm or deny his role in Stacy’s death because he likes to see Spider-Man squirm from the negative attention), Sheldon takes a chance and sees if Stacy’s daughter Gwen will be interviewed. 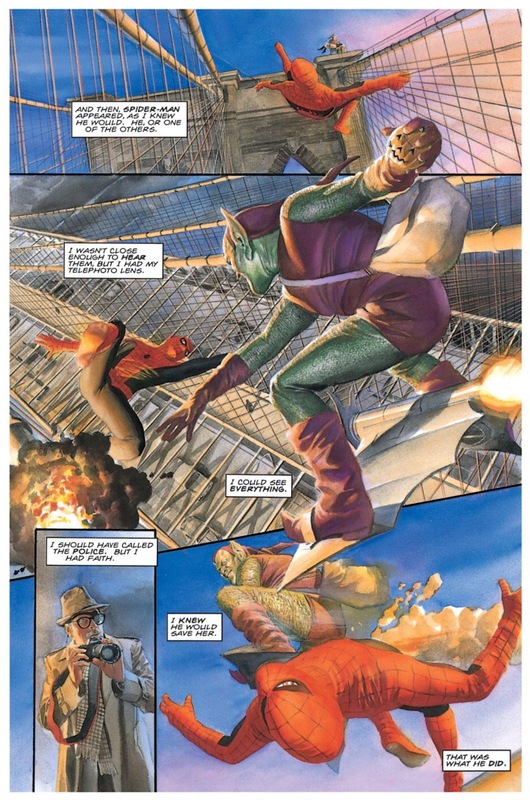 In the issue’s most breathtaking scene, Sheldon and Gwen are walking along the streets of New York when throngs of people start running in terror from an invasion being led by Namor the Sub-Mariner. Sheldon notes that it’s a “peaceful” invasion, but the most interesting part of the sequence is Gwen’s reaction. She stands there, taking in the scene, looking more curious than afraid. As Namor’s crew makes it rain down on the streets, Gwen looks up angelically and marvels at the beauty of the misting water. One of the primary reasons Gwen’s death was considered so shocking and controversial was because prior to Amazing Spider-Man #121, characters so pure and innocent just didn’t die in comics (outside of Uncle Ben, which is another reason Spider-Man’s origin is so significant). Busiek and Ross elegantly convey this idea that before her death, Gwen was pure, Gwen was innocent. Watching her see the best in a situation that has other people overreacting in terror makes her eventual death in this issue all the mort gut-wrenching for Phil and the reader. 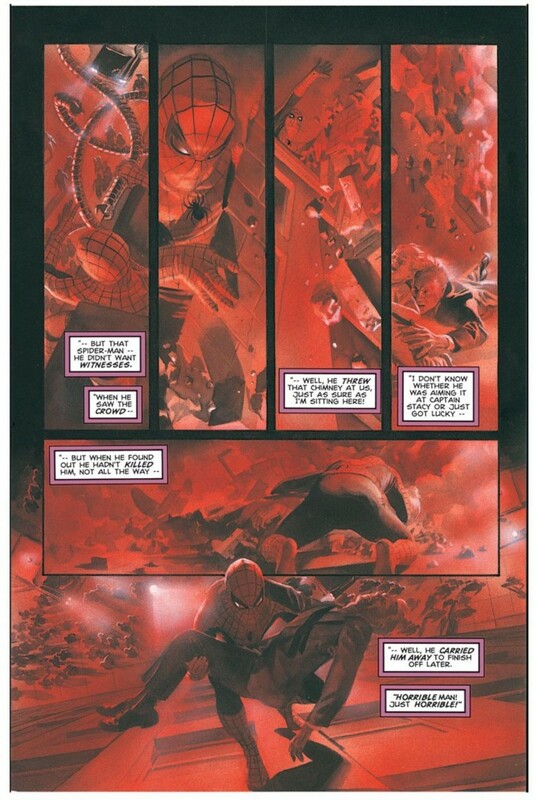 And boy, do Busiek and Ross sock you in the gut with Gwen’s death sequence. Visually, it’s nearly identical to what Gil Kane put forward in ASM #121, but Busiek’s script, which captures Sheldon’s perspective just rips your heart out. Phil is coming to interview Gwen when the Green Goblin is seen leaving her apartment window and flying to the Brooklyn Bridge. The whole time Phil keeps saying “someone” will save this innocent woman. 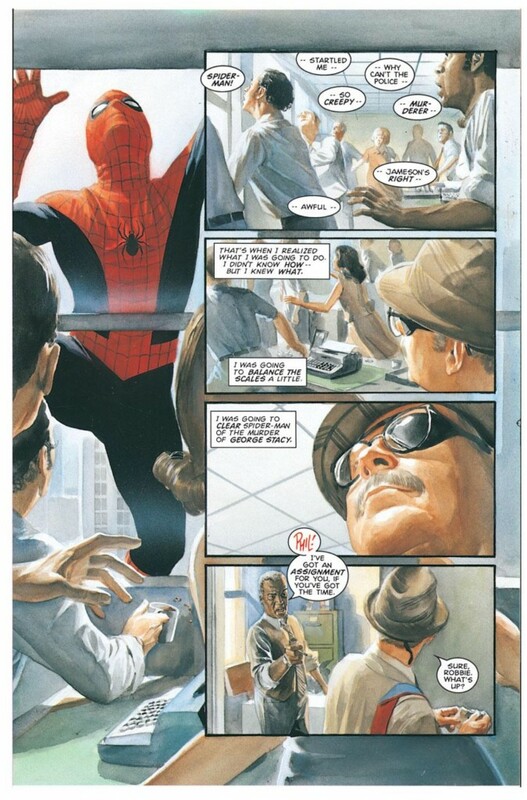 When Spider-Man shows up, Phil anticipates he’s about to witness a scene he’s seen countless times before in his career – the hero saves the day. Instead, Gwen is knocked off the bridge, and some webbing and a “snap” later, is dead. Phil’s reaction is the comic book equivalent of a shot being fired in a 21 gun salute: “He failed her. They all did.” What does Busiek mean by “they” here? It certainly could mean Spider-Man and his fellow Marvel heroes; they literally failed to save Gwen. But could Busiek be making a larger comment about the editorial circumstances around Gwen’s death? Conway, even in his interview with our Superior Spider-Talk podcast, defends his decision to kill Gwen because she was an uninteresting character at that point in time and the ASM title needed a dramatic shake-up. On its surface, I cannot disagree with this comment, but perhaps if the comic book industry wasn’t still stuck in some its hokier, fan-friendlier Silver Age conventions at this point in time, Gwen would have been portrayed as being more dynamic. That certainly is the case in Marvels, not to mention a few other posthumous storylines like Spider-Man: Blue. I love the despair Gwen’s death evokes from Phil and how he “retires” from photographing these heroes after this moment. Sheldon’s decision obviously mirrors how people call “The Night That Gwen Stacy Died,” the “end” of the Silver Age of comics. Phil’s career started during the Golden Age, when these heroes were both terrifying and something to behold, but as time marched on, the innocence of these “marvels” made way for darker, grittier tones that have continued to dominate the comic book industry to this day. You can quibble all you want about whether or not Marvels is a better story than Kingdom Come (written by Mark Waid with more art from Ross). I’m unquestionably a Marvel guy, so while I appreciate the brilliance of DC’s Kingdom Come, I’m firmly in the Marvels camp when it comes to best stories of the 1990s. The fact that the miniseries still emotionally resonates with readers like me 20 years after the fact makes Marvels one of the all-time greats for the medium. I looovvveee “Marvels” so much!! This is easily one of the best comics ever.